I went out - when was it? Dear God, my memory! - perhaps the day before yesterday and managed, while clambering around, to give my scope a boink against the side of a tree. The scope survived but when I fired off a few shots at a fence post to see if I was still zeroed the answer came back clearly: no, no, you're not still zeroed, actually, since you ask - you're now missing by miles. So I whanged about thirty or forty pellets into paper targets, yesterday, trying to bring the zero back and all the time I was doing this I was reflecting, grumpily, that I'd only just re-zeroed the damn thing the day before I'd given the scope a whack. I'm no lithe acrobat; getting over, through and under fences means I often bang the gun or the scope against posts, the ground or trees. By the time I'd finally got it sorted - and the knock had throw the zero out by an astonishing four or five inches, so there was much clicking of little scope adjuster wheels and firing of groups before the pellets started to fall within a respectable half-inch of the 30-yard bulls-eye again - I was feeling thoroughly fed up with the whole idea of scoped rifles. I tend not to shoot at anything over thirty yards away - so why do I have this damn great thing bolted to the top of my gun? Why don't I use the iron sights instead? There have been times - when a pigeon has landed in a tree a few feet above my head or I've peeped round a hedgerow and seen a rabbit about five yards away - when I've had to shrug and walk away because I've no idea where the aim point in the reticule would be for a target so close and - even if I did know - my grabbing the scope and trying to heave the parallax ring round to its minimum distance would probably have spooked the animal away before I'd had a chance to shoot. Which is to say there are times when I've simply wanted to point the rifle, look down the barrel and fire - and I haven't been able to because the device on top that allows me to observe the fauna three counties away is in the way. So I've dug the iron sights out of the cupboard and I'm contemplating them as I write. Looking at them, I feel much the way as I did when looking at my bicycle a couple of months back while I was deciding if I should sell my car: stuck between a fear of relying on what seems like a primitive technology and a yearning for things to be more simple. The car question resolved itself; the next service would've cost me everything I had in the bank - so that's easy: flog it, you have to. So I did. Now I get around fine on the bike and I wonder what I was so worried about. The scope question is an even easier one, of course; I can just try using the rifle with iron sights for a bit - learn how to use them - and see how I get on. So I will. Are there any iron sight afficionadoes out there? What does the world look like without a scope in the way? Thanks for the post. As you say, scopes are great until you give 'em a ding and your rifle becomes useless. Likewise for the close up snap shot. So I guess I'm all for iron sights - give it a go and see how it works. IMHO if you are dealing with paralax adjustment on an air rifle, you are probably over scoped. I can concieve of no useful reason to put a 1000 yard capable scope on a fifty yard capable weapon. Having said that, my philosophy is KISS, (Keep It Simple....) if it isn't fun, why do it? Iron sights are fully capable of delivering all the accuracy your gun is, the rub is in YOUR eyesight. I'm a righty, yet can't shoot long guns right handed, without spectacles, so I went with scopes. I also shoot left handed with the iron sighted rifles I own, a learning experience in itself, and do quite well. Be brave, give the iron sights a try. Thank you very much, folks. My scope is now sitting on my window sill and my rifle is a refreshing pound or two lighter. One thing: what's a good distance to zero an iron sights, 12ftlb air rifle then? Anyone got any ideas? Iron sights are good if you have a good "feel" for your weapon. As I have gotten older, iron sights have been giving me trouble. Now my Colt 1911 has fixed iron sights, and they are old school at that. But I've been shooting it for so long that if I can see the target, I can hit it. Like everything else, it is all a matter of practice. On air rifle scopes: Air rifle scopes are parallax adjusted to a relatively close range usually 25 yards. The problem is that the depth of field is very shallow. That necessitates a parallax adjustment for closer ranges. SBW sent me a UK air rifle magazine and the selection of scopes is phenomenal. I've been meaning to write about the magazines he forwarded they are really interesting in that the perspective on hunting and shooting is totally different in many cases to ours. I set my air rifle irons to 16 meters. Scopes are good, at times for long range shots, but in my collection of firearms (which numbers in the dozens) only a handful wear scopes on a full time basis as they are long range specific rifles as to build and set up. Those that do are my .223 AI and my .220 Swift. Everything else has quick release mounts and, depending on purpose, express sights or peep sights. I own a lot of optics and red dots but they mostly live on shelves in the gun room. All depends on what you want to do, if I'm shooting something that I need a scope for it's not generally with an air rifle. I realize that's a problematic approach in the UK re all the FAC hassles and storage requirements. My eyes do fine without optics out to about 150. Used to be 3-400 but eyes age...Inside of 25 yards, well I guess it depends on your eyes. If a scope allows you to make shots that your eyes won't work for at air rifle ranges, then use a scope. Experimentation never hurt anyone. My god, you are funny! Must be the gun influence. I've only found the iron sights to be a problem when trying to thread a pellet through foliage in the tree tops to hit a squirrel. I zeroed in at 25 yards, per the Beeman papers I found on the internet. Dr. Beeman (not affiliated with the company anymore, I believe) had some great info on that sort. Thank you Albert, Tom, The Crow and Mike. Albert - It's interesting that the scope selection in the UK - where we have so little space and so little available shooting - should be wider than it is in the States. Very strange. I look forward to reading your views on the subject should you ever commit them to, well, not paper - the net I suppose! Tom - That's very helpful, thanks. I've done a bit of preliminary zeroing at about 18 metres but there's more to do yet. It's very interesting though, the difference in shooting with open sights. I'll write about this soon I expect. The Crow - Thank you, friend. Mike - Thanks. I'd be very interested to read the Beeman article myself if you have the web address to hand. I only use iron sights. The only times I've used scopes have been the times I've shot my friends rifles. Most of my hunting and shooting is done within 25 yards. Scopes are an expensive luxury, here in Trinidad & Tobago. And thank you for the link to your interesting blog. I use this sight to determine the optimum point blank zero for my airguns. For iron sights, I generally use a sight height setting of 3/16 of an inch. The other items are dependent upon the pellet that you use, so I can't help you much there. The muzzle velocity can be worked out using the pellet weight and working back from 12 FPE. You'll find parallax adjustable scopes on most serious airguns sporting glass sights. This has less to do with range and more to do with the limited killing potential for an air rifle. You simply must hit your target in a vital area, and due to the limited power of the pellet, the vital areas are very, very small. On a rabbit, for instance, you need to place the pellet on a roughly one inch circle in the breadbasket in order to kill them. Outside of that circle, you'll probably just wound them. Plus, all pellets have lousy ballistic coefficients, so they tend to slow down very quickly making for really loopy trajectories. They're not spin stabilized as much as they are drag stabilized; hence, lousy BC. Because of these two factors, any parallax at all makes for lots of missed shots. So, you'll find adjustable objectives on most air rifle scopes of any power. For example, the range from near point blank zero to far point blank zero for an airgun such as Hubert's when using a one inch vital zone radius is around 30 to 40 yards. A comparable spread between near and far zeros on a good center-fire rifle might be as much as 200 to 300 yards for a "dinner plate" sized kill zone. It's literally almost an order of magnitude difference. Plus, all pellets have lousy ballistic coefficients, so they tend to slow down very quickly making for really loopy trajectories. They're not sping stabilized as much as they depend upon the drag of the open skirt to keep from keyholing; hence, lousy BC. Because of these two factors, any parallax at all makes for lots of missed shots. So, you'll find adjustable objectives on most air rifle scopes of any power. I can attest to their usefulness. 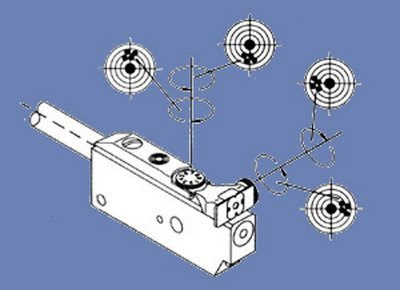 The range from near point blank zero to far point blank zero for an airgun such as Hubert's when using a one inch vital zone radius is around 30 to 40 yards. A comparable spread between near and far zeros on a good center-fire rifle might be as much as 200 to 300 yards for a "dinner plate" sized kill zone. It's literally almost an order of magnitude difference. Whoops, bad copy and paste on the last comment. Please ignore the last two paragraphs. www.beemans.net/fielduse.htm should get you close. My bad, they recommend a 50 yd zero for my rifle (Beeman R-1, .20 cal) not a 25. Mine is zeroed for 25 however. That sight is chock full of good reading.